EU FP7 call 4 is open and a good starting point is the main ICT page. Although you have to watch out, there are specific objectives from these challenges which are being addressed so have a good look at the call fiche. I had the pleasure to attend the TSSG hosted Irish Future Internet Forum in the Dublin Digital Exchange (part of the Digital Hub) on the 29th Oct 2008. I say pleasure as I know behind the scenes there was a real tight deadline to the pull this one together and Kevin D. and his team did an excellent job to do so. There were presentations giving an overview of EU & Asian activities in the Future Internet, with the Akari Architecture Conceptual Design for New Generation Network [pdf] is a quite interesting take on the societal considerations, future basic technologies, and design principles that should be used when designing a new network architecture. It appears that serious consideration has been given to both the top-down demands of solving societal problems and the bottom-up conditions of future available component technologies in the Japanese Akari, and its a programme I must take more indepth look at. With the accompanying EU website on ICT reaserch around the Future Internet worth a visit. This D2.1 is one of the 1st public deliverables of 4WARD [pdf] and it describes the technical requirements for a family of future global communication networks, with the potential to supersede current telecommunication networks as well as the current “internet” in the long run, as identified in the first phase of the FP7 project “4WARD”. I’ve given a more general overview of the document on on the main TSSG 4WARD page. Just to say most of my contribution in this document was towards the consolidation of the WP2 new architecture requirements and the WP4 in-netwrk management requirements. In WP2 we are developing an architecture framework that is flexible enough for specifying and realising a new family of interoperable network architectures with varying degrees of desired properties according to the needs of the targeted networking scenario (e.g., in a backbone network, a sensor network, or a mobile ad hoc network) while ensuring certain common principles and properties (e.g. interoperability, security, mobility, quality of service). Hence this framework has to take into account a multitude of network variants in order to facilitate the design of the “best” network for each task, each device, each customer, and each technology. I also had a part to play in pulling together the requirements for WP4 for In-Network Management in which we are devising an embedded “default-on” management capability which is an inseparable part of the network itself. This capability will generate extra value in terms of guaranteed performance in a cost effective way, and will enable the networks to adjust themselves to different sizes, configurations and external conditions”. The guiding principles to achieve this goal are decentralisation and self-organisation. The realisation of the In-Network Management paradigm includes developing a network management plane that self-configures and dynamically adapts to changes in networking conditions. The plane provides communication and coordination primitives for a range of distributed management functions. 4WARD In-Network Management addresses these challenges by introducing a thin, pervasive layer which performs core management functionalities already inside the network, but which can be complemented by additional management functionality outside the network where necessary. I must admit it is still early in the project and there are a number of significant advances being made, however at times it feels as though there are some many things happening in parallel its hard to keep up with everthing going on. I need to go back a little before I release some of my more recent activities and so before I get into the last concertation meeting  for the FP7 ICT Network of the Future projects an updated cluster map is available see below. From the 30th Sept to 2nd Oct there were cluster meetings, a plenery meeting and a couple workshops worth noting. For the cluster meeting, I attended the Workshop on Self-Management, which was organized by a partner of mine in the EFIPSANS project, Ranganai Chaparadza, and his presentation on the rationale, duration scope and structure of a new ISG being proposed towards ETSI for the Autonomic Network Engineering for the Self-Managing Future Internet [pdf] was quite interesting. A set of slides expressing the conclusions from this cluster meeting can be found here [pdf] and all the presentations for the day can be found on this link. While I had to head for Stockholm at the end of this 1st day, my collegue Kevin Quinn stayed for the plenary sessions, where there was some significant progress made on the Madrid Future Internet Assembly preparation [pdf]. Finally the last day completed with a 4WARD workshop on Future Internet ‘Business Innovation and Regulation Challenges [pdf]. The workshop was broken into 4 parts with Session 1 giving a 4WARD introduction and then an overview of the projects Use Cases and Business Models. Session 2 looked at Policy, Regulation & Governance and Session 3 covered Future Internet Innovations. It all ended with a Panel Discussion on the Network of the Future: Is there a business for a radically new approach? I always wondered if the word concertation was a real word. It appears it is, well in Wikipedia land, however in the dictionary of record OED I cannot find it at all as there is no publicly available search function and from Collins and Merriam-Websters I’ve not had much luck either, so does the word concertation really exist? 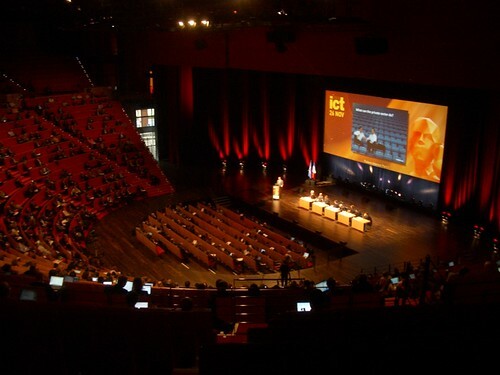 The ICT 2008 event in Lyon was massive ….. again it never ceases to amaze me the pure size of this event. There was just so much to cover at this event and it is interesting to see it from a number of different perspectives, such as Dave Levy’s entry on ict_2008_lyon and this report on the opening plenary debate of the ICT 2008. And you can gather a flavour of this event for yourself with a look at the plenary session videos. Although as with any conference there were networking sessions that were not run very well, and then there were sessions such as the one on Societal and ICT perspectives: the impact of Trust, Security, Dependability, Privacy and Identity, which ran very smoothly (okay shameless plug this session was organised by the TSSG). There were 11 people from the TSSG including Paul Malone, Mark McLaughlin, John Ronan, Martin Serrano, Jim Clarke, Kevin Doolin, Jason Finnegan, Huaiguo Fu, Keith Howker & Sinead ( I hope I haven’t missed anyone) and I would be interested to hear their thoughts on participating in such an event.